When used properly, screws and bolts give the builder an extremely strong connection that can be readily and easily undone when required. However, due to the improper use of a screwdriver, you may strip your screws, making it impossible to loosen the connection. This is where a screw extractor comes in. This product is basically designed to undo the damaged screws or nuts that a screwdriver cannot screw out. However, a poor-quality screw extractor can damage the screw head further as well as waste your time and energy in the process. For this reason, our review covers some of the best screw extractors that you can find in the market, with a view of helping you find the product that is more suitable to help you undo worn out screw heads. 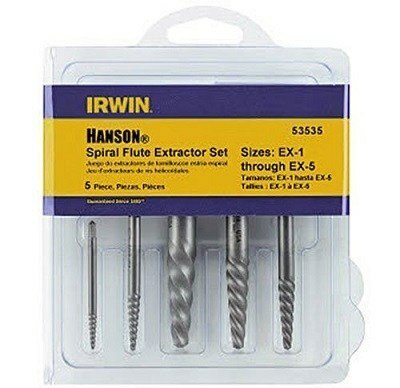 Though slightly expensive, Irwin Tools’ Hanson 53227 is the top-rated screw extractor set in this review because it consists of 25 pieces, each featuring an aggressive left-hand design for that extra gripping power. The pieces have an easy-out design that makes the spiral flutes embed themselves deeper into the metal as the tool is turned so grip increases as the resistance increases. A high carbon steel construction ensures that this resistance is no big deal to the extractor, which means that only the screw head bears the brunt of the friction between the two. This causes the piece to eat into the metal screw until it gains enough traction to spin it out. 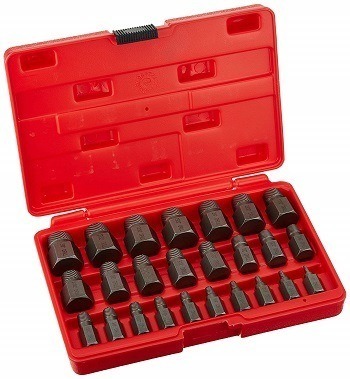 Each tool has its size etched into it for quick identification and the set includes extractors from 1/8 to 7/8 inch, which are all designed to remove broken studs, bolts, socket screws and fittings for high torque applications. A heavy-duty carrying case is included for organized storage and ease in transportation. 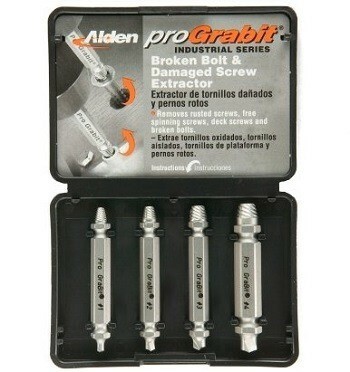 The Alden 4-Piece Grabit bolt and damaged screw extractor set is made from M2 High-Speed Steel and is tempered twice for extra hardness, resulting in a tough and durable tool that can carry out multiple extractions. These bits include the smallest (bit #1), which handles No. 4 – No. 7 screws and No. 10 bolts (5mm), bit #2, which handles No. 8 – No. 10 screws and 1/4-inch bolts (6mm) and bit #3, which handles No. 11 – No. 14 screws and 5/16-inch bolts (8mm). Lastly, the final piece (bit #4) is designed to handle No. 16 – No. 24 screws and 3/8-inch bolts (10mm). Though few in the set, their 2-step drill bit-and-extractor design makes them usable on a wide array of screw and bolt sizes. Each of them is meant to be spun using a variable reversible drill but they can also be used while attached to a 1/4-inch hex screwdriver to remove many type screws such as; Phillips, Slotted, Hex, Tri-Wing, Pozidriv, and other tamper resistant fasteners. Irwin Tools’ 53535 is a 5-piece spiral screw extractor set (EX1 – EX5) that is packed in a reusable pouch for storage and portability. Even though a drill bit is not included in the kit, each extractor has its size and recommended drill bit etched on its side for quick referencing and easy use as you prepare to remove broken studs, fittings, socket screws and bolts in maintenance/ repair work. The product is actually designed for harder metals because it is carded, meaning that punching through its target is a breeze. On top of this, a spiral flutes design ensures that each extractor embeds itself deeper into the metal as the tool is turned so that as the fastener resistance increases, the extractor’s grip increases. Other features include an aggressive left-hand spiral design for extra gripping power and compatibility with screw sizes in the range of 3/32 to 5/8 inch. 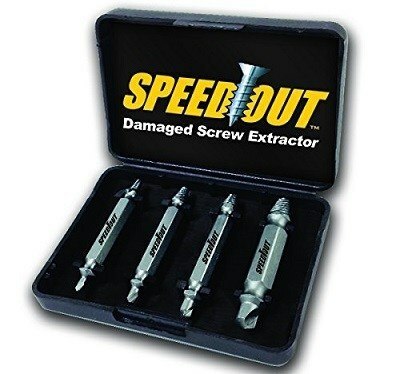 If you don’t mind spending a little bit extra, this product is one of the best quality screw-extractor sets to consider in the market. 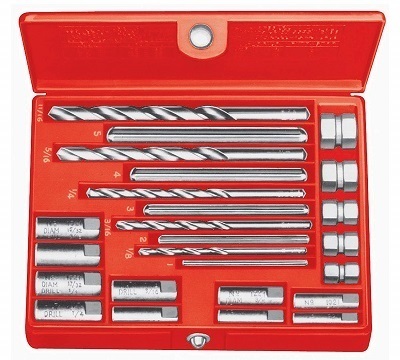 This is because it contains 20 precision tools, which include extractor models 1 to 5 with turn nuts, drill models 1 to 5, and drill-guide models 921 to 1821. With this, you get a wide variety of drill bits and extractors to remove screws that range from 1/4 to 1/2 inch in size. With tough steel construction, these extractors are very effective at removing stripped or broken screws and toughness in them improves their ability and durability for extended use. Other features include a durable preformed plastic box is used to keep the pieces organized inside and also easy to transport to the site while each one of them is clearly marked for easy identification before use. This SpeedOut kit from Ontel SpeedOut is our best budget extractor for this review because you get a lot for its price. For starters, it includes 4-piece extractors that have a 100% carbon steel construction, which makes them strong enough to pierce through screw heads with ease. Also, the extractors are very easy to use, requiring only 3 quick steps, which are drilling, flipping and extracting. This all happens in a very short time and is great for carpenters, mechanics, and technicians. The other benefit that you get with this set is that each piece contains its own drill tip on the opposite side of the extractor, and this contributes to its 3-quick-step ease of use explained above. This drill tip has a self-centering design that prevents drill walking, making it easier to prepare the drill head for extraction. Other features include compatibility with quick chuck connect systems as well as Philips, flat and hex heads. 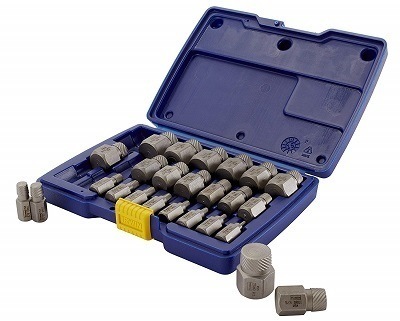 Neiko’s 04204A is one of the best bolt extractors because it comes as a 25-piece extractor set that can remove bolts, studs, screws, pins, threaded pipes and fittings. Each piece has a hexagon head for easy application of maximum torque using socket wrenches while the lower side contains precisely machined aggressive multispline teeth that have a left-hand spiral design to provide extra gripping power and faster threading. Also, each one of them is clearly marked with high visibility markings for quick selection and matching of the right drill bit. This is quite important because drill bits are not included. Other desirable features include a strong and durable chrome molybdenum steel construction and a heavy-duty carrying case for organized storage. 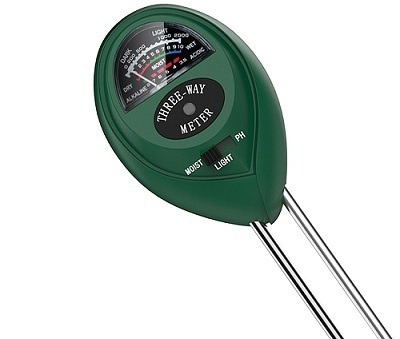 Made from high-quality stainless steel, this product is surprisingly very affordable but is still sturdy enough for long term high-speed rotation while working in high-temperature conditions. The kit contains four different bit sizes with diameters ranging from 3-12 mm and is therefore suitable for any drill and screw or bolt size. However, these bits are only designed for small scale damaged screw removal, not commercial screw extraction, which means you should not exert the set to a lot of pressure. 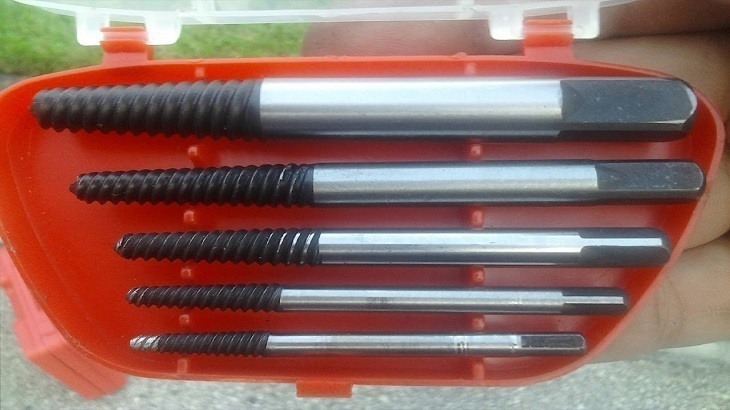 On the small-scale extraction though, the set is ideal for the removal of stripped, damaged, embedded, rusted or painted over deck screws, making it an ideal tool for every homeowner. Model numbers are engraved on each extractor’s surface for easy identification and use, and a plastic case is included for storage purposes. Screws do not have a universal size. There are a variety of screw sizes that are used in different applications. While some extractors are designed to handle any screw size, others are designed to work on specific screw sizes. This means that you should know the type(s) of screw(s) you want to extract beforehand. With this information, you can be able to determine which is the best kit to buy by looking at its compatibility range. An important thing to consider though is to look for a kit that has many pieces of varying extractor sizes so that you will not need to purchase another pack in the future when you encounter a different challenge. The material used to construct the extraction tool will help you determine its quality and durability. Common materials that are strong enough for extraction include hardened or carbon steel, high speed, steel and generally, most steel alloys because of the toughness of steel. Having extra features such as corrosion and rust resistant is also good because these will extend the lifespan of the product. Gripping power basically determines how long it will take the extractor to get the screws or bolts removed. A good extractor tool should be designed such that it increases the gripping power as the resistance increases and features to look for include a left-hand spiral design, which gives superior gripping power. Most modern screw extractors come with matched drill bit sizes etched on the case as well as on the piece itself. This makes such a product easier to use, especially if drill bits are not included in the pack. It is important to look for such a feature so that identification, matching, and selection of the tools will be quick and effortless. However, the most ideal extractors are the ones that have a 2-in-1 drill bit and extractor design because no matching is required. You just have to carry out the whole process in 3 steps, which include drilling, flipping, and extraction. In conclusion, screw extractors are necessary components in your tool arsenal because you will most likely encounter stripped screws in general car repair/maintenance or in construction work. Choosing the best screw extractor might not be easy, especially if you are a beginner, but having a good grasp of what constitutes a good extractor will help you choose your preferred tool. After going through the screw extractor review above, it is our hope that you have an easier time picking the best screw extractor set that works for you.